Imbolc or Candlemas (also known as Brighid’s day or Bride’s day) is the Holiday that marks the sun’s growing strength. We begins to see the days grow longer. In many places, we observe the first signs of spring. Imbolc is the time of initiation, the time of beginning. We look forward to spring and summer, preparing for the activities done in the warm time of year. We order seeds from catalogs and make vacation plans. 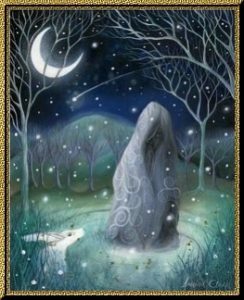 Imbolc is a time for weather magic and divination, as evident in the tradition of “Groundhog Day”. All life depends on water. Water that comes from the earth in springs and wells is especially precious. Since the Goddess is the living earth, wells and springs are her lifeblood. We drink from pure sources and feel refreshed. Fire is energy, warmth, the spark of life itself. Fire keeps us warm, and cooks our food. Just as the returning warmth of the sun and the spring rains awaken (heal) the earth, causing it to give forth life once again, the influence of the Goddess heals us, inspires us, awakens the creativity within us. She is the Goddess of Poetry. In Irish mythology, Brighid was the daughter of the Daghda (DYE-dah or DOW-dah), meaning “The Good God”. Daghda is the God of abundance, food, and plenty. He is seen as a giant, a big man who carries a big club, which stands for both life and death. Shaped like the new shoots pushing out of the earth, it can also hit you over the head and kill you! The Daghda reminds us that life and death are always linked. The Daghda is the powerful life of the earth itself that begins to reawaken under the rays of the growing sun. The giant figure of the Daghda reminds us that the earth is bigger and more powerful than we are. Just as Brighid is the Goddess of the Poetry, the God as this time of year is also the Poet, whose words of power can bring healing or change the future, the guardian of secret knowledge. A bowl of water is a necessity for your Imbolc altar. I collect rain water during the year, that I bless and use as holy water in my rituals. I save some of each of these collections, and put all the collected waters in my cauldron at Imbolc. Collecting samplings of water from places visited would also be most appropriate. Also on the altar: Many, MANY candles! But, please, PLEASE be careful! Never leave your candles burning unsupervised, especially when small children or pets are around. Also, a Brighid’s Cross (woven from wheat) and pictures or symbols of fire and water. The traditional colors of Imbolc are white, red, and black (the colors of the Triple Goddess) Pink and silver make nice accents. Not only are fiery scents appropriate, but smells associated with cleansing and healing. Dragon’s blood, frankincense, mugwort and red sandalwood are appropriate as incenses. Herbs include lavender, heather, sage and lemon. For your Imbolc fire, Birch wood has a strong association with Brighid. Brambles, blackberries and willow are also appropriate. Imbolc is the time for Spring cleaning. It is time to clear out the dust and cobwebs and prepare our homes, and ourselves, for the activity and growth that come during the spring season. This will take several days. I allow about a week, ending with the final ritual on the day of Imbolc. First, physically. Use vinegar and mugwort to was your windows and mirrors. Sweep down cobwebs and dust under books. Throw away all prosperity and protections charms that are dusty and old. Dust and polish all wooden hex signs, witch bottles and other ritual objects. Next, psychically. Light a smudge stick (sage and lavender) and let the smoke reach every corner of your house. Blow the smoke behind doors, under furniture, even down drains! Open the windows and wave the smoke outside, taking the negative energy with it. Next, sprinkle holy (blessed) water around, followed by salt. Anoint wooden, bone and antler ritual items with appropriate oils. Take a ritual bath. Fill the tub with lavender salts or oils. Soak for as long as you like, allowing all negative energy soak away. Scrub your nails, your hair, every place you can think of. As the water drains from the tub, visualize it carrying away all the negativity from you, leaving you fresh and clean, psychically as well as physically. Cast a circle in your ritual space. Use Lavender oils or buds to create scent, filling the room. Think about the areas of your life that you would want to be more calm, peaceful. Ask the Goddess for ideas to create that peace. Add frankincense and Dragon’s Blood to the scents, again filling the room. Think about what you want to strengthen in your life. Ask for ideas to create that. Decide what you can do to create peace and strength in your life and create a plan whereby you can do this without stress.